OMG. I make no bones about it I love the Hunger Games books and movies. Both are so good and so powerful. Well written and well crafted books; well crafted movies. Now what I also really love and admire about the movies is the marketing department. Whoever they are they go above and beyond the call of duty and ROCK OUT the advertising of these movies. How? By creating a Website that is The Capitol – The Official Government of Panem. OMG. 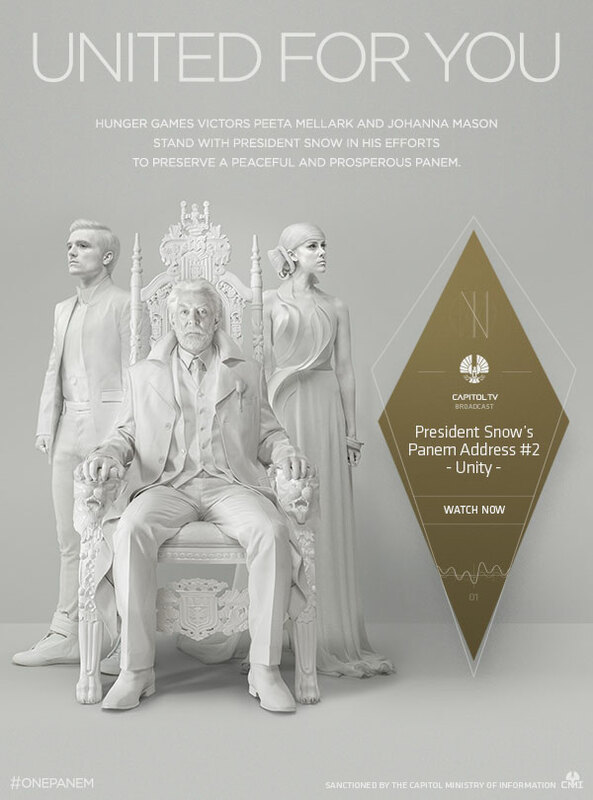 When you visit this site you are in the Hunger Games world and visiting the Website of the story villain – The Capitol. Throughout the years this Website has advertised the new Hunger Games, aka movie, had fashion shows Katniss and Peeta got a great spread last year, and a few weeks ago there was a feature about about the Districts. This is also accompanied by emails to us fans – yeah, I get them – and great things for adding to Pinterest and Tumblr. Now people I gotta tell ya’, they have outdone themselves with the latest teaser for Mockingjay, Part 1. Witness the latest propaganda video called Unity below. I mean whoa!! There’s propaganda, Beetee breaking in, Snow being EVIL, it’s all WHITE, Peeta is totally brainwashed, and WHAT!?!?! is that Joanna Mason on the other side of Snow?!?! Oh wow!!!! It took me three times of watching this video to figure out it was her. So amazing. So people watch the trailer again – oh my but I will – and salute the marketing team of these movies for constantly wanting you to watch more.